That’s what many are saying, as the world’s biggest real-estate swindler and the world’s most corrupt judge meet in a Manhattan courtroom on Monday, Tuesday, and Wednesday. At issue: billions of dollars in loot from the demolition of the World Trade Center complex on September 11th, 2001. World Trade Center owner Larry Silverstein – who confessed on national television to “pulling” World Trade Center Building 7 – will appear in the courtroom of Judge Alvin Hellerstein at 500 Pearl St. in New York City. The non-jury trial, which is expected to last three days, will decide whether Silverstein is entitled to recover $3.5 billion from airlines and airport-related companies, in addition to the $4.9 billion he has already received for his “losses” on September 11th. The question on everyone’s mind is: Why is Silverstein claiming that airliners destroyed his buildings, when he has already confessed to demolishing at least one of them himself? In the 2002 PBS documentary “America Rebuilds,” Silverstein admitted to complicity in the controlled demolition of WTC-7, a 47-story skyscraper that dropped into its own footprint in 6.5 seconds. Despite his confession to demolishing his own building, Silverstein has already received $861 million from insurers for Building 7 alone, as well as over $4 billion for the rest of the Trade Center complex. That $861 million for WTC-7 was paid on the basis of Silverstein’s claim that airplanes were somehow responsible for making Building 7, which was not hit by any plane, disappear at free-fall acceleration. The insurance companies are not openly accusing Silverstein of insurance fraud, presumably because doing so would threaten to demolish the 9/11 cover-up and bring down the US and Israeli governments at free-fall speed. But they have gone so far as to call Silverstein’s demand for more money “absurd,” a considerable understatement. The insurance companies claim that Silverstein’s demands amount to “double recovery.” They say that Silverstein was already paid $4.9 billion – vastly more than the paltry $115 million or so that he and his backers paid for the complex just weeks before it was demolished – so why is he asking for another $3.5 billion? Silverstein’s answer: He needs the money. And does he ever. He was originally demanding an extra $11 billion, before Hellerstein capped it at $3.5 billion. The insurers have not mentioned the fact that the World Trade Center Towers were condemned for asbestos in early 2001, just months before Silverstein bought them in July, six weeks prior to their demolition. They have not mentioned that Silverstein doubled the insurance coverage when he purchased the Trade Center. They have not mentioned that Silverstein hardballed his insurers to change the coverage to “cash payout.” They have not mentioned that Silverstein engineered his purchase of the Trade Center through fellow Zionist billionaire Lewis Eisenberg, Chair of the Republican National Committee and head of the New York Port Authority. Silverstein and Eisenberg have both held leadership positions with the United Jewish Appeal (UJA), a billion dollar Zionist ‘charity’ organization. Silverstein is a former chairman of the United Jewish Appeal-Federation of Jewish Philanthropies of New York, Inc. This is an umbrella organization which raises hundreds of millions of dollars every year for its network of hundreds of member Zionist agencies in the United States and Israel. According to Ha’aretz, Silverstein is a close friend of Israeli Prime Minister Netanyahu. They speak on the phone every weekend. The insurance companies have likewise neglected to mention that after doubling his insurance coverage immediately before 9/11, Silverstein re-doubled his winnings after 9/11 by claiming double indemnity. According to Silverstein’s spokesman, “the two hijacked airliners that struck the 110-story twin towers Sept. 11 were separate ‘occurrences’ for insurance purposes, entitling him to collect twice on $3.6 billion of policies.” The bizarre double-indemnity claim was approved in 2004. Additionally, the insurers have failed to mention that on the morning of 9/11, Silverstein and his daughter both failed to show up for their daily breakfast at Windows on the World restaurant atop the North Tower. Both offered flimsy pretexts — Silverstein claiming that he had suddenly remembered a dermatologist’s appointment. LARRY SILVERSTEIN AND HIS DAUGHTER LISA . . . ALL SMILES AFTER THEIR MIRACULOUS ESCAPE ON SEPTEMBER 11, 2001 WHEN FATE DECIDED TO SPARE THEIR LIVES . . . BUT NOT THE LIVES OF 3000 OTHER PEOPLE. How has Silverstein managed to get away with murder, in the most obvious case of insurance fraud ever? Thanks to his partner in crime, Judge Alvin Hellerstein. Hellerstein’s courtroom is Ground Zero in the cover-up of the crimes of 9/11. 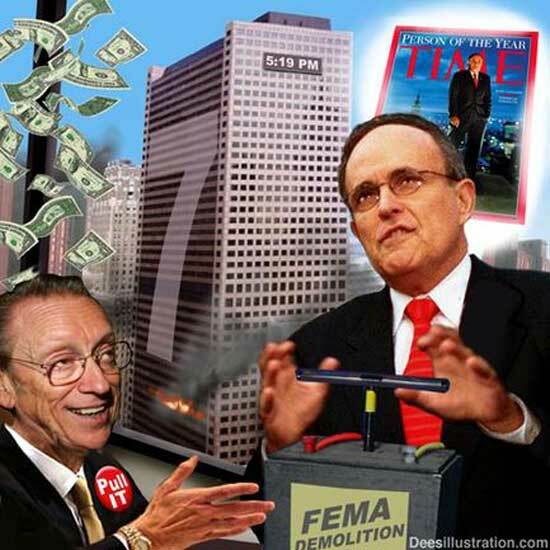 Virtually all 9/11 litigation has been funneled through his courtroom, including Ellen Mariani’s recent lawsuit against Bush, Cheney, Rumsfeld, Wolfowitz, and others. Like Silverstein and Eisenberg, Hellerstein is a rabid Zionist with close ties to Israel. The judge’s son and sister both emigrated from the US to orthodox Zionist settlements in the Occupied Territories. Hellerstein’s son is an Israeli lawyer who emigrated to Israel in 2001 and whose law firm works for and with the Rothschild-funded Mossad company responsible for the 9-11 terror attacks. the Mossad-controlled airport security firm named International Consultants on Targeted Security (ICTS) N.V., which is the owner of Huntleigh U.S.A., the passenger screening company that checked the passengers that boarded the aircraft at the key airports on 9-11. Both Alvin Hellerstein and his son Joseph worked for the well-known Jewish law firm of Stroock, Stroock & Lavan before moving to the positions they now hold…Stroock, Stroock & Lavan played a key role in the setting up of 9-11…Stroock has a long history of representing the Rothschilds and other high-level Zionists. Will New York City 9/11 skeptics protest the Silverstein-Hellerstein trial this Monday through Wednesday? Will truth and justice ever triumph . . .
. . . with this man as judge? In order to triumph, truth and justice will have to defeat the world’s wealthiest and most powerful criminal network.